"A love story for the modern age." Cohen Media Group has debuted the official US trailer for the upcoming release of François Ozon latest film, The New Girlfriend, starring Romain Duris, Anaïs Demoustier and Raphaël Personnaz. This first premiered at the Toronto Film Festival last year, and also played at the London, Stockholm, Zurich, Hong Kong, Seattle, Glasgow, and Montclair Film Festivals. The story follows a woman who discovers her late friend's husband, played by Romain Duris (seen in The Beat That My Heart Skipped, Mood Indigo, Chinese Puzzle), likes to dress like a woman. It looks like an interesting film, almost like something from Xavier Dolan or Wong Kar Wai, with beautiful cinematography and vivid performances. Claire (Anais Demoustier) discovers a secret about the husband of her late best friend, Laura. Following Laura's death, Claire reaches out to comfort bereaved David (César-nominated Romain Duris), only to discover his secret: he enjoys dressing as a woman. In writer-director François Ozon's provocative new film, he elevates his exploration of modern sexuality and femininity to a new level. The New Girlfriend, originally titled Une nouvelle amie, is written & directed by acclaimed French filmmaker François Ozon, of Criminal Lovers, Water Drops on Burning Rocks, Under the Sand, 8 Women, Swimming Pool, Time To Leave, In the House and Jeune & Jolie previously. It's adapted from Ruth Rendell's novel of the same name. 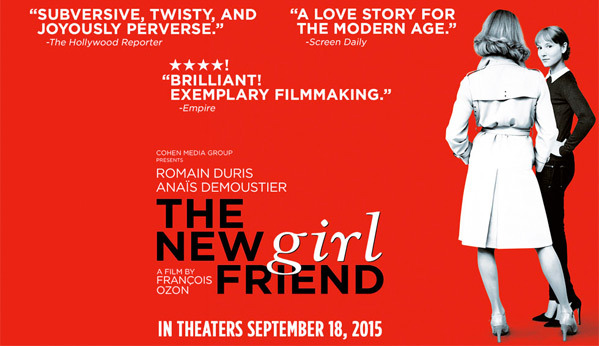 Cohen Media Group will debut The New Girlfriend in select US theaters starting September 18th this fall. Is François Ozon really Frank Oz? Looks good to me. Seems like it's riding the knife's edge in terms of weird, goofy, drama.